Sugar, spice and . . . two stroke? Just what every little girl’s room (or big girl’s room for that matter) needs. It’s casted on fiberglass and resin painted and polished. And it’s big: L=54″ W=12.75″ H=38″ Located in Washington, it’s $637.13 not including shipping. StatueDecor.com also carries a scooter Betty Boop. Thanks to Erwin A. for this fab find. 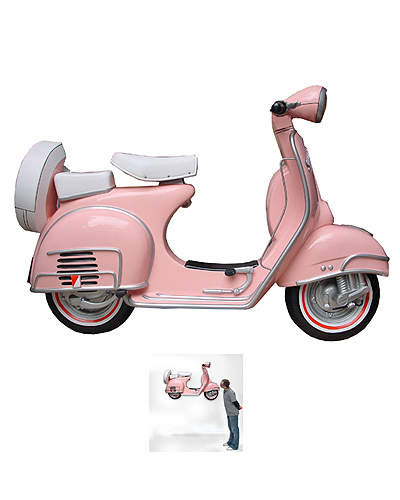 This entry was posted in Art and tagged 3-D, Art, model, pink, scooter, vespa, wall by Tracy. Bookmark the permalink.